Regardless of the age or level of the player or pitcher its never too early or too late to introduce proper and safe grips when throwing a baseball. There are 108 double stitches on a 5oz baseball making the configurations of the seams produce movement, baseball spin rates and pitch speed relative to finger placement. Most importantly many youth elbow issues can be avoided simply by adjusting the grip. Healthy baseball grip for Little League players is the same as the proper baseball grip used by MLB Players. Establishing a simple understanding of 1 specific baseball grip for a position player and 3 basic baseball grips for a pitcher can positively impact the health of an arm while increasing performance levels. Infielders, Outfielders and Catchers rely on accuracy (not movement) to deliver throws directly to Bases, Homeplate & Teammates. 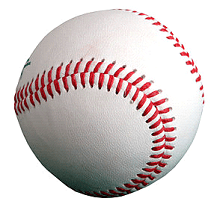 The four-seam grip with the pointer & middle finger on a seam with the thumb symmetrically positioned directly under the baseball and between the pointer/middle fingers. A Pitchers ability & ultimate success is measured by three factors: Command, Movement & Velocity. Generally speaking. A proper 4-seam grip generates maximum pitch speed and spin rates. A proper 2-seam grip maximizes pitch movement. 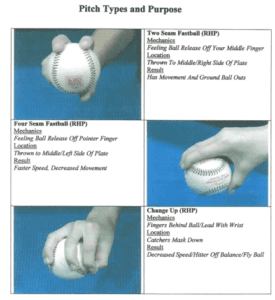 Various Changeup grips result in subtracting pitch speed with increased movement. Become comfortable with these grips to maximize throwing/pitching performance levels while reducing the risk of arm injuries when throwing a baseball. Use baseball grips to increase pitching velocity. The next Level for maximum pitch velocity is to add effective pitching motion by working on your biomechanics for overhand throwing.